Kali Saxton-Shaw grew up in Fort Collins, CO, and has always enjoyed travel, both within the US and internationally. Prior to becoming a PA, she studied Microbiology and Virology (Bachelor’s and Master’s degrees) from the University of Vermont and Colorado State University. She worked in public health, both in the field and in a laboratory, with New York State Department of Health and the Centers for Disease Control for 8 years prior to going back to school to pursue a career in clinical medicine. She has lived and worked in Vermont, Colorado, Montana, New York, Puerto Rico, Chile, Ecuador and Uganda. She received her Master’s degree to become a Physician Assistant from the University of Colorado in 2016 and has been working with Dr. Sheridan since receiving her license to practice medicine. The program at the University of Colorado had extra training in pediatrics, while also emphasizing care across the lifespan. 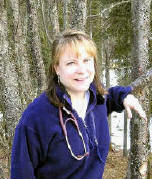 As a PA, Kali maintains national certification and licensure within the state of Alaska. Her professional passions include preventative medicine, newborn care, women’s health, mental health and wellness, and travel medicine. She enjoys empowering people to improve their overall wellbeing. She appreciates family medicine for the opportunity to interact with people of all ages and from all walks of life. In her free time, Kali loves spending time outdoors with her husband, son and their dog. She also delights in hiking, cooking, photography, and sewing.